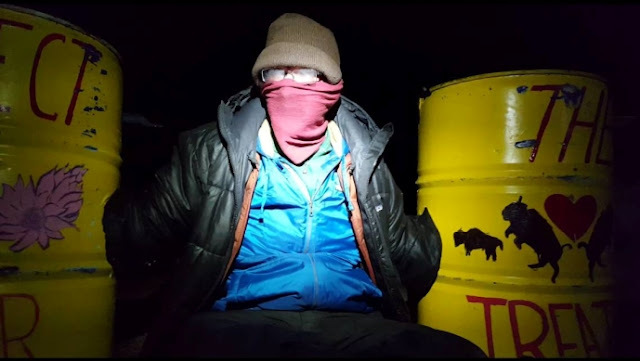 Activists had locked down to three concrete-filled barrels in an attempt to block slaughter trucks from accessing the trap and transporting wild buffalo to slaughter facilities. More than 1,000 wild Yellowstone buffalo have been hunted, slaughtered, or held for quarantine (domestication) so far this winter. Fewer than 3,700 buffalo remain in the country’s last wild, migratory herds. The Wild Buffalo Defense press release stated that the two men who locked down today have been identified as Wolf and Coyote. Their release reported that the men “blocked the gate with three 55-gallon drums filled with concrete, locking their arms inside the barrels.” The barrels contained two messages: “Protect the Sacred,” and “Honor the Treaties.” Yellowstone’s trap and the maltreatment of the country’s last wild buffalo is viewed by the majority of indigenous people as a continuation of genocide. By around 9am, the two men had been removed and arrested. Due to extensive law enforcement sending people away from the scene, Buffalo Field Campaign patrols were unable to see the men, but they did report seeing yellow barrels blocking the access road. Wild Buffalo Defense reported seeing tractors making a new road (photo), and later BFC witnessed the stock trailers using this road to drive around the blockade, destroying habitat (photo) important to elk, deer, pronghorn, and buffalo, in order to access the trap and load up wild buffalo for slaughter. 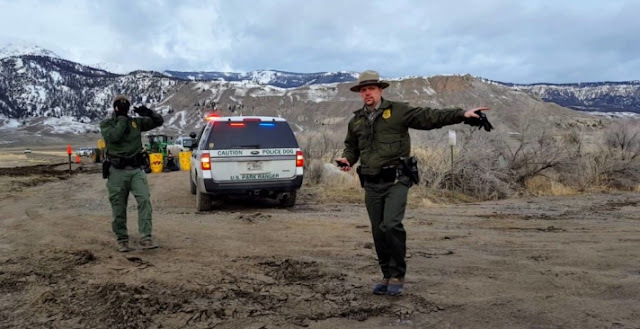 BFC was able to get some photos and footage before being asked to leave by law enforcement, who claimed they were “obstructing” the adjacent county road, Old Yellowstone Trail. Footage and photos are available upon request. This is the second time that Wild Buffalo Defense has targeted Yellowstone’s trap. On March 6 (BFC press release), two men locked down to the squeeze chute – the Silencer – inside Yellowstone’s bison capture facility. The press release from Wild Buffalo Defense concluded with, “…Buffalo are sacred creatures to the Plains Indians. Blackfeet and Lakota prophecies say that when the wild buffalo return, the people and the earth will be healed. Yellowstone National Park currently captures and slaughters about 25% of the herd every year. If this mismanagement of the population continues, these prophecies will never be fulfilled. 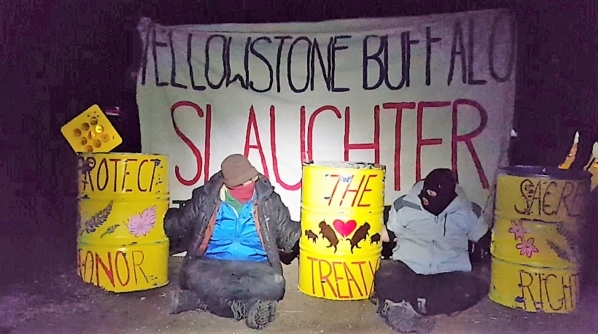 Responses to "Activists Block Road to Yellowstone Buffalo Trap"